Two rooms: one a sonic space filled with wicked darkstep jungle beats and exploratory hiphop transmutations, the other carrying deep transmissions of ambient space and dubadelic harmony; both spaces saturated in the visible frequencies with video mixes, evolving collages of thirty years worth of camera-mediated popcult, psychedelia, and synthesized color swirls, topped off with feedback units parasitically remixing the body of anyone within range of the lens. That was the scene at Mass Art on Feb. 22nd as Toneburst got up the latest in a series of experimental music events. In the "jungle room," Boston's one and only diehard drum 'n' bass promoter, Al Fougy, kicked things off in a darkstep collaboration with London-based MC G, whose satiny rapping meshed perfectly with tough beats and wild samples. 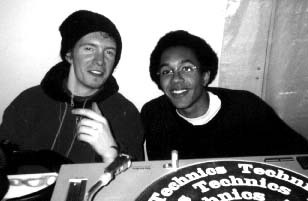 DJ Rupture, aka Jace Clayton of Radio Inteference, followed up with a wicked techstep set, and DJ C, aka Jake Trussel of Electro-Organic Sound System, served up some choice downtempo abstract hip-hop on an ambient-leaning plate. Over in the "ambient room," beatless technicians Embryo, Bionaut, and Spool were among those diffusing chill atmospherics and synthetic acoustic washes for a mellower alternative to the rave-like scene across the hall. The audience, a mix of rave fans and hip students (Mass Art and Harvard were well-represented), picked up the ball, getting more immersed into the total-environment vibe as the night wore on. Toneburst is a loosely-knit posse of drum 'n' bass DJs, ambient musicians, video buffs, performance artists, and installation architects dedicated to the creation of immersive atmospheres and "sacred" spaces oriented toward a new concept of what the word "concert" means. Jake and Jace helped make the Toneburst collective happen as a way of combining the resources of the electronic diaspora in the area. The result is a spectacle that can't be described as the work of a "scene," but rather the collective understandings of a group of "folks who just came out of the woodwork," as Jake puts it. It's not so much a community defined by common aesthetic currents as a guerrilla force brought together out of a similar musical ethos. Jake explains that Toneburst is the logical result of the philosophy behind his ambient researches as Electro-Organic Sound System: The idea that gets it all rolling, he says, is "the possibility of digital media and electronic media becoming more and more organic." The spacey mix of hip-hop beats and dubadelic samples on Electro-Organic's debut CD "Herbanism" figures a difficult set of tensions between organic and digital, urban and suburban, ambient and beat-driven; moving back and forth between the poles of each dyad, the music won't sit down in a tidy corner waiting for a critical classification to be forced upon it. The indeterminate genre-play goes hand-in-hand with the remix ontology (reappropriation as redefinition and creation) that fuels the samplers and turntables of Toneburst. The loose connections of the Toneburst collaborators precludes the unity manifested in New York's illbient scene, where artists frequently work together and press coverage is extensive and admiring. Toneburst is also distinct from Soundlab (a multigenre/multimedia effort in New York) in that its ethos comes from opposition to, rather than inspiration by, the musical and acoustic trends of the city. "[T]he sonic architecture of Boston is what inspired me to want to do something different. The dance music scene is just house and techno," Jake says. Even more, the cultural currents in Boston seem only partially committed to being urban -- the crusty provincialism and sour isolation of a suburb is always lurking under the surfaces of central Boston. While New York's illbient revolution feeds on the raucous energies of the city's archetypally urban environment, the Toneburst work poses questions about the status of the city/suburb distinction; the result, at least in the Electro-Organic philosophy, is music that firmly refuses to take one side or the other on the issue. Combined with the natural use of the Internet as collaborative/creative tool (and source for samples), this works against the development of a "Boston electronica scene" marked by distinctive cultural signifiers. The dominance of alternative rock, house, and techno tends to produce the expectation that an electronica event is identical with a dance party. "We almost have to set it up on the flyers as a dance party, because of the nature of how concerts attract people. Dancing is a cool interaction, but people get stuck in that as a format," says Jake. Jungle and its musical cousins offer the choice between head-nodding appreciation and frantic, marionette-like raving; during the last Toneburst show, the audience's reaction was weighted decisively in favor of the latter form. Tougher still for the Toneburst crew is the problem of loyalty to local talent: so far, jungle events in Boston have only drawn large crowds when big commercial names like LTJ Bukem have been in the house. The question of whether Toneburst and other electronica acts will survive in Boston remains open. A Toneburst event in late April will feature DJ Spooky, the darling of the New York illbient scene; his "media-soluble" presence (in Jace's words) will certainly increase attendance, if not an ongoing interest in local electronica. Toneburst is spearheaded by artists on a philosophical mission: trying to avoid being pigeonholed into a genre, or thought of as a mere facility for dancing and socializing, while simultaneously pushing the limits of experimentation and listenability. Jace sums up Toneburst's indeterminate status with an open sentence: "Hopefully people will come, and then we'll find spaces for it. We're underground, and if you can be underground with just enough of a crowd to support it�" The ellipses, marks of uncertainty and indecision as well as the desire to avoid closure and completeness, speak volumes.